California State University, Northridge’s Friends of the Oviatt Library welcomes members of the community to nominate their favorite stories about the San Fernando Valley for consideration of the San Fernando Valley Award for Non-Fiction. 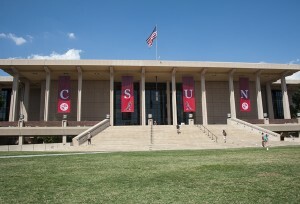 CSUN’s Delmar T. Oviatt Library. Photo by Ruth Saravia. The Friends of the Oviatt Library — a volunteer, non-profit organization that supports and enhances resources at the Delmar T. Oviatt Library — created the award to promote research and writing related to the region, as well as to honor and underscore the importance of non-fiction writing about the area. Acceptable subjects for submission include social, behavioral, physical and life sciences, history, biographies, autobiographies and humanities. Submissions must also be original, produced in book format and relate directly to the San Fernando Valley. The winner of the award will receive $1,000. Authors, publishers, and members of the community may request a submission application by visiting the library’s San Fernando Valley Award for Non-Fiction website or calling (818) 677-2638. Entries must be submitted no later than Dec. 1, 2017. The Oviatt Library serves as the main research facility in the San Fernando Valley and is located at the center of campus at 18111 Nordhoff St. For more information about the Oviatt library please visit the library website at or call (818) 677-2855.